My plans are designed to help busy homeowners save time on the details and save money by avoiding costly decorating mistakes for a stress-free experience. Love your home! We can help. 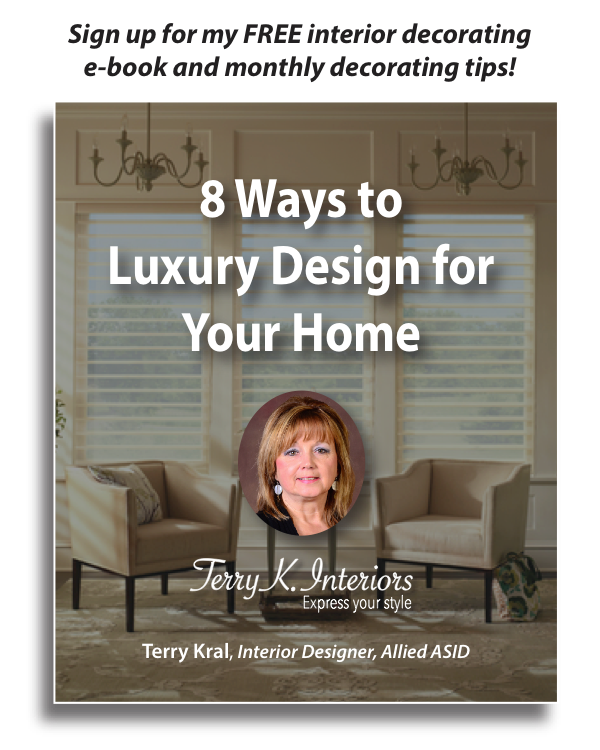 Hi, I'm Terry Kral, interior designer and owner of Terry K. Interiors and Window Wear Etc. I graduated high school in 1973 and had no idea what I wanted to do for the rest of my life. I worked at a few accounting jobs before getting serious about indulging in a career. I always knew I was artistic and creative but never knew just how to use it. At age 32, I decided to go to college to earn a degree in interior design. Married, with a 4 year old at the time, working a full time job, and going to college in the evenings was a difficult but wonderful journey that put me on the right path. I wouldn't have changed anything about my experience. Interior design is the creative outlet that I needed. The learning never stops and I continue to evolve with each and every project I work on today. I enjoy working with my clients who come from all walks of life. More importantly I love the positive impact interior design has on making their lives better. Having a professionally designed, beautiful, functional, and stylish home to enjoy is priceless. I believe everyone has style. I can help you express yours. will make your life easier, less stressful, and more enjoyable!" My mission is to help you design your home to reflect your unique taste and personality while elevating your personal style with professional results regardless of budget. My flexible services allow me to work with you in a way that works best to help you create a comfortable, affordable, functional, and classy interior. There is always a way to decorating with style! I can show you how. Love your home! click here to request an in-home appointment with Terry. With 25 years experience designing residential homes I have learned just how to help my clients accomplish their dream design. A professional assessment will lead to a solid action plan. As an educated designer I have trained eyes to spot issues you may not notice. A well thought out plan is key to the success of your design. The order of things to execute a design plan will be helpful to determine what to re-purpose. I can help you avoid costly decorating mistakes and save you time with a plan to keep you on track. I have designer resources that you may not find in local furniture stores and can provide you with a customized design. If you prefer to shop locally, I can help you find furnishings, accessories, and finishes to accomplish your design. I can add a great deal of aesthetics to your space and create the WOW factor that will elevate your personal style. I can help you work up a budget you are comfortable with or stay within one you have already determined. I can also work with you as a liaison between you and your contractor to build a stronger bridge to help you avoid things that may be overlooked.